The popularity of data centers in scientific computing has led to new architectures, new workload structures, and growing customer-bases. As a consequence, the selection of efficient scheduling algorithms for the data center is an increasingly costlier and more difficult challenge. 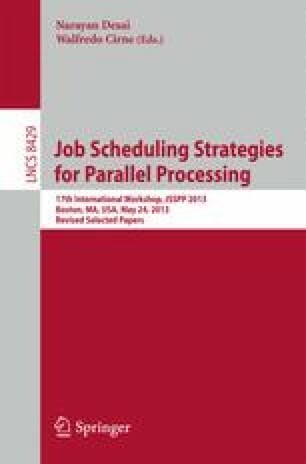 To address this challenge, and contrasting previous work on scheduling for scientific workloads, we focus in this work on portfolio scheduling—here, the dynamic selection and use of a scheduling policy, depending on the current system and workload conditions, from a portfolio of multiple policies. We design a periodic portfolio scheduler for the workload of the entire data center, and equip it with a portfolio of resource provisioning and allocation policies. Through simulation based on real and synthetic workload traces, we show evidence that portfolio scheduling can automatically select the scheduling policy to match both user and data center objectives, and that portfolio scheduling can perform well in the data center, relative to its constituent policies. Supported by the STW/NWO Veni grant 11881, the Dutch national research program COMMIT, the Commission of the European Union (Project No. 320013, FP7 REGIONS Programme, PEDCA), the National Natural Science Foundation of China (Grant No. 60903042 and 61272483), and the R&D Special Fund for Public Welfare Industry (Meteorology) GYHY201306003.